Gold Tone : Gold Tone CC-50RP. New. Producten > Mandolinshop > Banjo's > Gold Tone > Gold Tone CC-50RP. New. 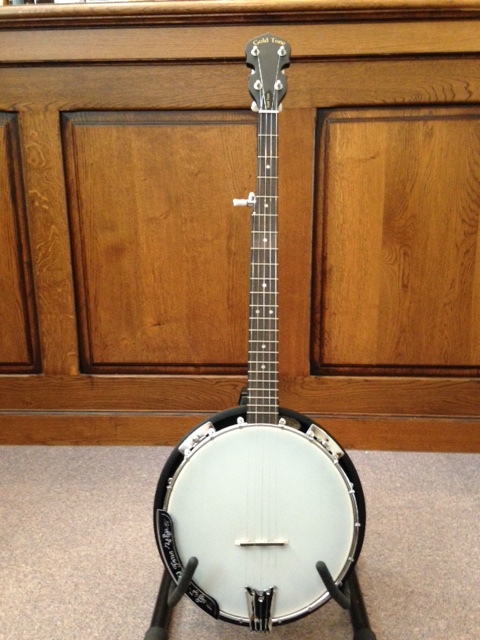 Goldtone CC-50RP resonator banjo. New. Additonal spikes. Our popular CC-50 has been the openback banjo of choice for thousands of beginning players for many years. The CC-50RP adds a full-walled resonator and high quality planetary-gear tuning machines to offer a value-packed first Bluegrass banjo for thousands more. Great sound emanates from the hard rock maple rim topped with a brass rod tone ring. The flangeless CC-50RP converts easily to an openback banjo for exploring clawhammer or folk style playing; just pop off the resonator and mounting brackets and you're done. Deluxe touches include a rosewood fretboard, Terminator tailpiece and a geared fifth-string tuning peg. Gold Tone's expert factory setup assures great playability sound right from the start.